This morning, between torrential rain showers, I went on a free (or donation) walking tour of my local Musrara neighbourhood, which starts at the lifeless Safra Square (it only gets better from there) every Saturday morning at 10.30. It is organised by a local group of artists named Muslala (they chose a happier name than the neighbourhood’s…‘ra’ means ‘bad’ in Hebrew, we were told!). The tour covered the area’s history – in short, an affluent late C19th Arab neighbourhood, which after it was abandoned/fled from in 1948 became a hard-nosed and deprived neighbourhood of Jewish immigrants right on the frontline with Palestine, had lots of drug problems, artists started to move in and then gentrification gradually took place – and also local works of public art. These guys push the boundaries of what art is, in a really exciting way. From murals on community noticeboards; to a community garden and carpentry studio; to ceramic flowers surreptitiously ‘planted’ on concrete apartments to beautify and integrate them – their work is all about creating dialogue between people who don’t normally interact. In answer to a question from an Israeli in the group about how some of this constituted art, our guide, Nathan, responded: “We see art as a bridge between people”. Which leads me to the Watermelon Festival. In a bit of wasteland, generously referred to as a field by our guide, on the southern periphery of Musrara, Muslala decided last year to hold an informal festival which would provide the opportunity for Arabs and Israelis to come together, with watermelon and music. 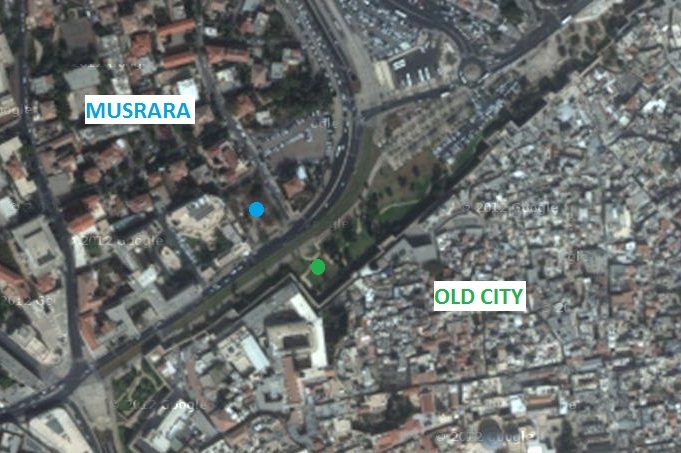 After some difficulty obtaining permission from the owner of the site, Muslala mooted relocation to across the road – we’re talking 20 metres here – to some manicured grass by the Old City walls. To my uninformed eye (as the other eye nervously watched a rat scuttle along the wall of the wasteland we were standing in) that site seemed by far the better option. But ultimately the buy-in of local Arabs depended on what side of this seemingly ordinary road it was held on. Not so ordinary, after all, though – this road is part of the now barely visible seam line between East and West. To hold the event on East Jerusalem soil would be, as Nathan put it, “to stamp on the Arabs’ necks”, or to legitimise the Israeli Occupation. They were more comfortable for the Israelis to extend hospitality to them from West Jerusalem, understandably. The event was a success, and Muslala are aiming to host the festival again this summer, despite resistance from some Musrara residents. An attempt on Micrsoft Paint (I miss Photoshop!) to show the two sites with blue and green dots – the road between is the seamline. I don’t want to go on too much (well I do, but I’m restraining myself) and I don’t want to give too much away of what is a must-do-for-yourself tour…but I will tell you one last thing that’s too good not to share. In commemoration of a local resistance group called the Black Panthers (who were Arab Jews, no less), Muslala decided to dedicate a previously unnamed alley in the area. The Black Panthers, as I understand it, were a radical social protest group of mainly second-generation immigrants of North-African descent, which formed in Musrara in the 1970s. 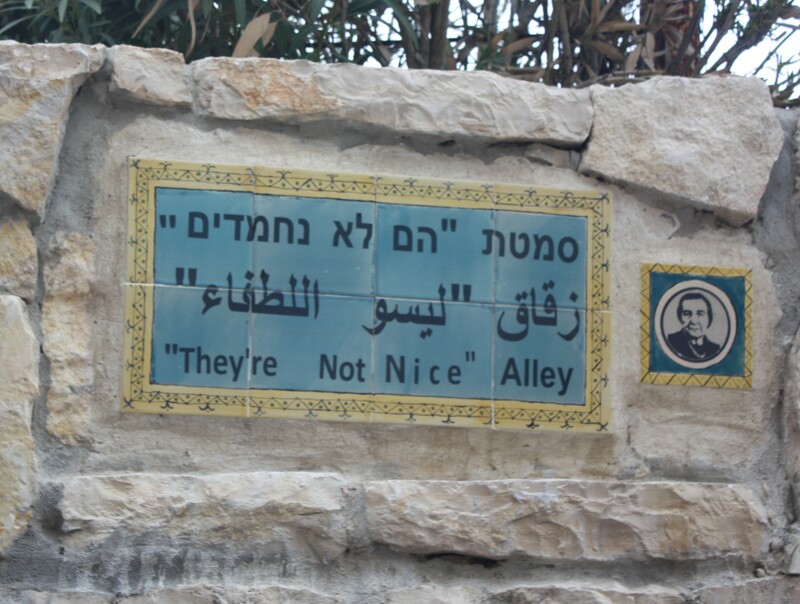 After meeting with them and hearing their objectives, the Prime Minister Golda Meir reportedly had just three words to say about them: “They’re not nice.” And so 40 years later, and with a touch of irony, Muslala designated“They’re not nice” alley in memory of the group, and their famous dismissal. If you’re at a loose end in Jerusalem some Saturday morning, I strongly urge you to go on this informative and provocative (in a good way) tour! Keep writing: you write well.